The design for a memorial statue dedicated to the nurse and Crimean War heroine Mary Seacole has been chosen. 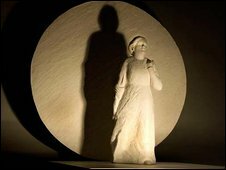 Artist Martin Jennings created the winning sculpture, which will stand in the grounds of St Thomas' Hospital in central London. The Jamaican-born nurse was voted the greatest Black Briton of all time in a poll in 2004. The statue is expected to be erected at its London location by the end of 2010 or early 2011. The Mary Seacole Memorial Statue Appeal was set up to create a permanent reminder of the 19th Century nurse. In 1854, she approached the War Office asking to be sent as an army nurse to the Crimea where there were known to be poor medical facilities for wounded soldiers. She was refused but funded her own trip to the Crimea where she established the British Hotel near Balaclava to provide comfortable quarters for sick and convalescent officers. 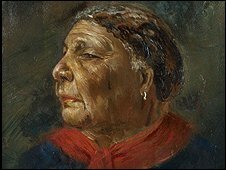 She also visited the battlefield, sometimes under fire, to nurse the wounded, and became known as "Mother Seacole". Baroness Amos, the chair of the Mary Seacole Memorial Artist Selection Panel, said she richly deserved to be recognised. "People in - not just the black community, but in ethnic minority communities generally - will feel very pleased because it's like a real recognition of the contribution that we have made to Britain's history. "Britain's history has been diverse for generations and we need to recognise and understand that." Miss Seacole, who rivalled Florence Nightingale for her feats in the Crimean War, was the daughter of a Scottish soldier and Jamaican mother. Mr Jennings said: "She'll be facing Big Ben and marching towards the river - a wind, as it were, coming off the river - representing in some ways perhaps the wind of the resistance that she had to push against constantly in order to achieve what she wanted to achieve with her vocation. "This is a wonderful location."